Friday May 31st 1878 It was raining this morning and continued till nearly noon. I sewed all the forenoon. In the afternoon Mother, Hatt, and I all three had to go to town on some legal business. Mamie Wilde stayed here with May. I got me a new dress this afternoon. It was supper time when we got home. I did not sew any in the evening. 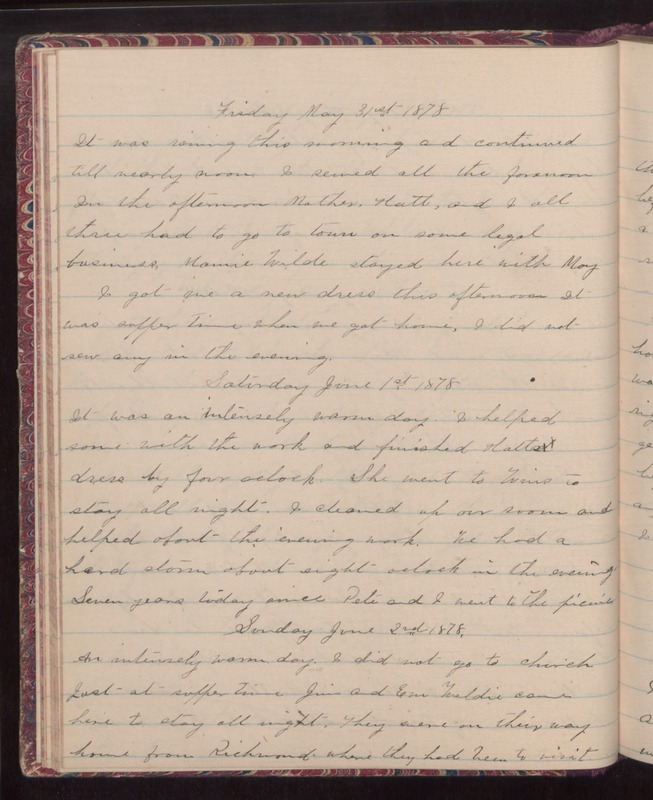 Saturday June 1st 1878 It was an intensely warm day. I helped some with the work and finished Hatts dress by four oclock. She went to Wins to stay all night. I cleaned up our room and helped about the evening work. We had a hard storm about eight oclock in the evening. Seven years today since Pete and I went to the picnic. Sunday June 2nd 1878 An intensely warm day. I did not go to church. Just at supper time Jim and Em [Gereldie?] came here to stay all night. They were on their way home from Richmond where they had been to visit.